If money were not an issue, I would have at least one of every diminutive design that Little Nest offers. 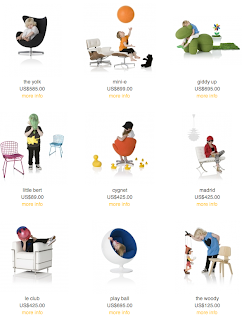 This Australian company makes high-quality reproductions of iconic modern furniture, scaled for kids aged 3-12. My favorites? 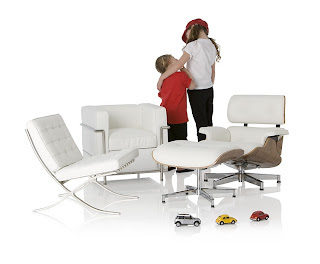 Hard call but I would go with the Mini E, a reproduction of the classic Eames Lounge. 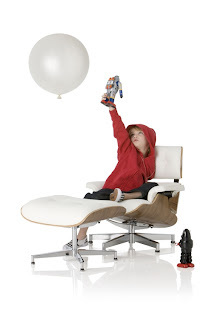 And of course the Play Ball, a miniature version of Eero Aarnio's space age Ball Chair. 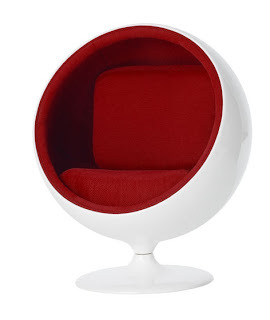 I have coveted one of these shiny spherical seats since seeing Ann-Margret's white and mirrored bedroom in Tommy when I was probably Jasper's age. Yeah, I pretty much still want to be her…macrame jumpsuit, silver platforms, maribou everywhere=awesome incarnate. Little Nest offers surprisingly reasonable flat rate US shipping for all of their wares and a 14-day money back guarantee. I'd love to know if their stuff is as gorgeous in person as it is on their website, so if you've purchased anything please share your experiences in comments. Disclosure: I did not receive any compensation or a product to review for writing this post. Sadly. I would gladly accept some product samples to sit my kids upon and squeal at their cuteness. Or the cats. Or Stella, our basset puppy. I remember our older neighbors growing up had a chair similar to that one from Tommy though it was rattan or something with orange cushions. I loved sitting in it. They're stuff is too cool for my house!